Eastern redbud flowers make for a pretty, and healthy, salad garnish. Eastern redbuds add not only beauty to spring landscapes but a dash of color to a spring salad as well. The pink flowers of one of Missouri's native trees are edible and were consumed in Native American diets. The trees have been used as landscaping ornamental trees since the 1600s. Before picking the flowers, make sure you are selecting from trees that haven't been exposed to any chemical sprays. Some landowners will spray nearby fruit trees in spring and you don't want to be consuming any residual spray. What do they taste like? Eastern redbud flowers have a very clean taste, similar to a lettuce. Doesn't this little salt and pepper tableau suggest "it's mine, it's ALL mine"? I was a guest speaker at a local garden club and was charmed by how the hostess easily brought an Easter theme to her table decor with her bunny salt and pepper shakers. Browsing through a local resale shop, I found my own bunny-themed salt and pepper shaker set, a white rabbit with a yellow bow literally holding a carrot. When I first spotted the two, the rabbit seemed to be hiding the big carrot from me. I don't blame the rabbit, it was a very nice-looking carrot. The carrot easily comes away from the bunny paws but not for long! I love both rabbits and carrots so the combination was perfect to add a little Easter theme to my kitchen. Cost $2. I was a guest speaker at an area garden club lunch meeting and was charmed by how beautifully the table was set. One of my favorite details was the set of bunny salt and pepper shakers in the middle, easily bringing an Easter theme to the table. Although I tend to pick flowers to match my table settings, I would be tempted to build my table around these two charming porcelain characters. Their colors are quintessential Easter - pinks, blues, yellows and spring green, not forgetting the pink easter egg one is holding. Don't they look like they are ready to hop right off the table? Edible pansies make a lovely garnish on deviled eggs. One of the advantages of meeting monthly for a bee club are the goodies people bring to share. During our March 2016 Rolla Bee Club meeting, a plate of deviled eggs showed up for a snack beautifully garnished with small spring pansies. Pansies are edible and make a lovely garnish for eggs as well as salads and other dishes. For many of my friends, pansies mark the beginning of the growing season. If you buy them from a garden center, you are buying plants that have been treated with pesticides to prevent bug damage. Please wash them before using. Use a spray bottle with warm water and gently spray so you don't damage the delicate petals. Allow to dry. Cover if refrigerating. Adding color to any dish does not have to be complicated. Herbs not only make a nice garnish but add a nice pop of color. These deviled eggs also had a sprinkling of fresh sliced green onions that added a nice touch of green. Delicious! Deer eating my strawberry plants suggested I was missing another source of salad greens. Sure enough, wild strawberries are edible and their young leaves make a nice addition to a spring salad. 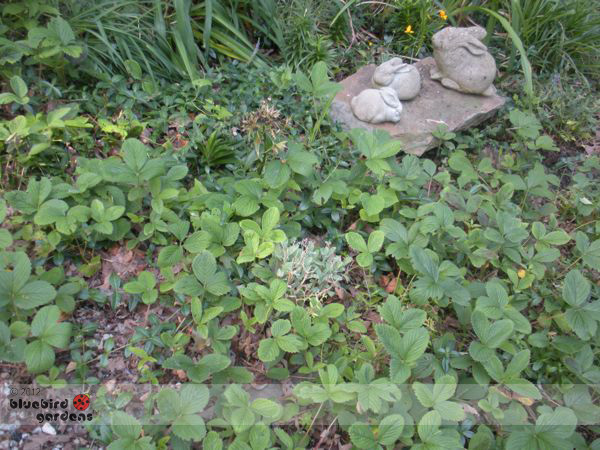 My patch of wild strawberries has expanded on its own over the years. 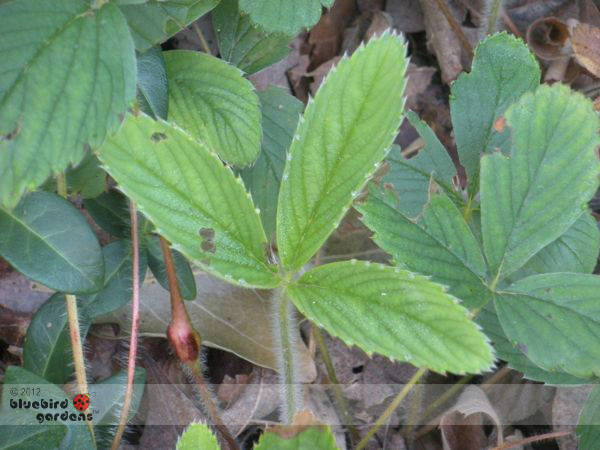 It's a perfect spot to cut young wild strawberry leaves because it's not exposed to any chemicals. There's a good reason why gardeners make good cooks and vice versa. 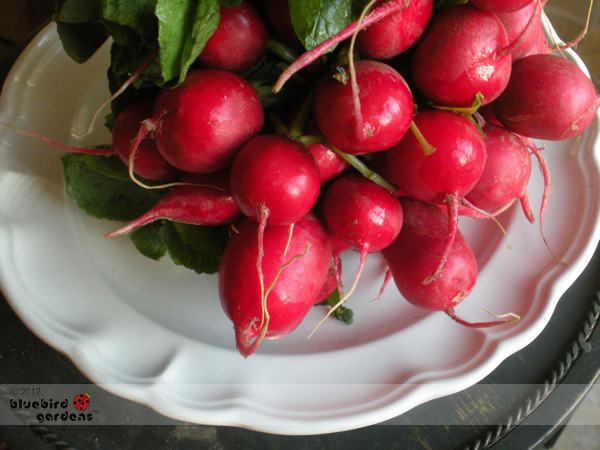 Having fresh produce is one of the secrets to a good meal, and one of the must haves in any spring garden is radishes. These red tuberous vegetables are almost impossible not to grow. They row quickly, and add such a dash of color and peppery flavor to any salad or special dish, even if they are not included in the recipe. 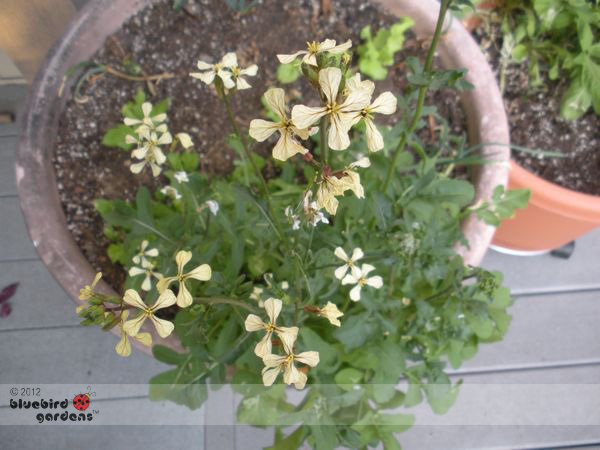 The whole radish is edible; use green tops in salads or steamed as a side dish, and if they happen to flower before you can pick them, the flowers are pretty garnish and edible, too! Do you grow radishes in your garden?